Ambitious men think big. But 52-year-old Chen Forng-shean, rather driven and certainly not lacking in aspiration, has been spending his productive years scaling down the size of his work. In fact, this miniaturist’s creations are best viewed and appreciated with the help of a magnifying glass. Taiwan’s best-known talent at the miniature craft only last weekend revealed his newest masterpiece in anticipation of the arrival of the lovable panda pair Tuan Tuan and Yuan Yuan from China in December. He created an incredibly tiny but nonetheless lifelike panda couple out of resin, attaching them to the eye of a sewing needle. They measure only 0.7 of a millimeter, truly Lilliputian in size. A sentence below reads: “I am going to Taiwan?” Years ago, Chen made as many as six tiny pandas, seating them in a row on the eye of a needle. Chen Forng-shean once unveiled a mini masterpiece, a pig smaller in size than the tip of a pencil. He used a grain of white sand to give shape to a miniature porcine animal measuring only 0.15 cm. in length, 0.8 cm. in width and 0.12 cm. in height. Inspired by William Blake’s poetry about “seeing the world in a grain of sand,” Chen labored for 30 days over this microscopic project. Tiny surfaces constantly catch Chen’s sharp eyes as potential media for him to work on. He once drew the image of President George Bush on the face of a diamond. Next to it he wrote the common Chinese reference to the American head of state, which translated to mean “the younger Bush.” He also scribbled U.S.A. and R.O.C. on the gem. Each diamond he picked had a surface measuring 0.2 cm. in length and 0.2 cm. in width. What Chen drew and wrote on the diamonds were visible only under a microscope. Over the years, Chen has aroused a lot of curiosity and interest through his writings and illustrations on a rice grain, pumpkin seeds, sesame seeds, dental floss, noodle strands, the bristle of a toothbrush, a toothpick, a paper clip, a matchstick, the wings of a dragonfly and the wing of a fly. At the height of the President Bill Clinton-Monica Lewinsky scandal, he drew the faces of the former U.S. president and the White House intern on the tip of a matchstick to give his miniature interpretation of the tale of passion making the hottest headline in those days. He with his fondness for poetry once copied Chinese verses on five sesame seeds. Each sesame seed was filled with four verses and each line had seven Chinese characters, setting a world record in Chinese calligraphy. Eight illustrated classics, which Chen produced in thumbnail edition and in the original languages in which they were written, tended to grab the attention of visitors privileged to visit him at his private museum in Hsintien, Taipei County. The place, which looks like a laboratory full of microscopes, is open for visits on Sundays. But appointments must be made by phone in advance. Chen copied children’s tales from different countries like “Snow White and the Seven Dwarfs” in English, “The Little Polar Bear” in English, “The Frog Prince (Der Froschkoenig)” in German, “The Little Prince (Le Petit Prince)” in French, and “Momotaro” in Japanese. The fine calligrapher once copied 10,000 Chinese characters in a size visible only under a powerful magnifying glass to reproduce the 38-page “Three Hundred Tang Dynasty Verses.” Chen is still a long way from retirement. “Taiwanese Verses (Part One)” was only recently completed. “The copying process was less of a challenge than the binding of the tiny, fluttering pages,” revealed Chen. Chen, an art and design graduate from a vocational school in Taipei, has been employed as an engraver at the China Engraving and Printing Works for almost 30 years. This plant handles the printing of currency bills in Taiwan. Chen’s job is to see to it that the extremely fine lines on the paper bills come out clear and perfect. “The best tools I use at my workplace are also what I utilize in my hobby,” he said. Good eyes and steady hands are important in his job as well as in his hobby, he admitted. “Chi kung,” a traditional Chinese exercise involving controlled breathing, helps keep his vision in peak condition, according to Chen. To watch him at work is to see how he holds his breath while executing a design barely visible to the naked eye. His scribbling or drawing hand hardly moves due to the small size of his work. Only last September, Chen received an invitation to participate in the St. Petersburg International Calligraphy Exhibition. The organizer, who had met him at the Taipei International Book Exhibition, knew about his talent in Chinese calligraphy. 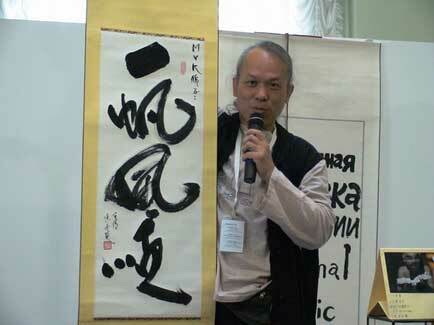 Over 60 calligraphers from 27 countries were invited to the event in Russia. Chen, Taiwan’s only invited participant, arrived with seven calligraphy works. However, he also demonstrated his talent on the spot, producing four calligraphic works. Then the moment for a bit of showmanship came. He went one step further, downsizing his calligraphy before unbelieving eyes. Chen outshone all the other calligraphers at the international exhibition by producing three miniature works of art in the limelight. Using a very fine brush, he wrote on the wing of a housefly: “Russia, I Love You”. His amazing feat drew great admiration from the public. But Chen did it for Taiwan and, thus, his glorious and shining moment belonged to Taiwan, according to Chen. Each demonstration by this patient man harboring the ambition to break all existing records in his microscopic art and craft leaves everyone gasping in disbelief and awe at his skill. His works have made it to the Guinness Book of World Records. Chen Forng-shean’s accomplishments are indeed for the books. Miniaturist Chen Forng-shean is a fine calligrapher. 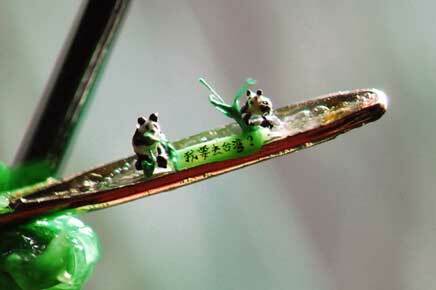 The anticipated arrival of two pandas from China inspires the creation of this pair of miniature resin pandas, shown seated on the eye of a needle. 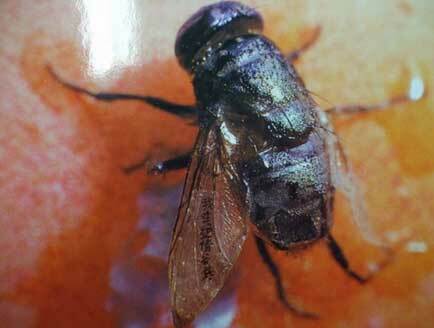 Written on the wing of a fly are Chinese characters with the message, I am trapped at the bottom of a gorge. 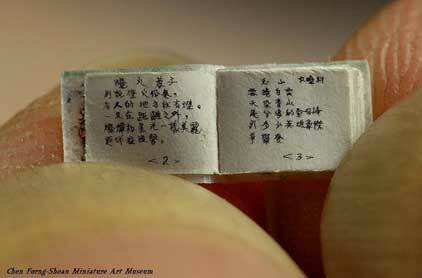 A thumbnail edition of Taiwanese poetry volume was produced by the miniaturist from Hsintien. 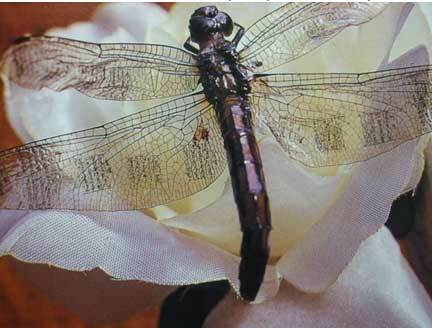 Chen Forng-shean fills the gossamer wings of a dragonfly with fine Chinese calligraphy. 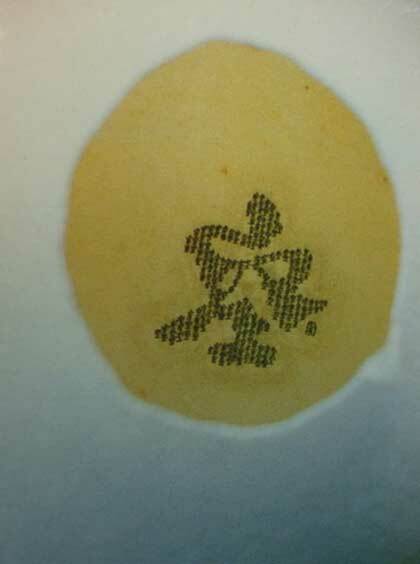 Chen Forng-shean writes the character meaning empty 248 times to create this big-sized character inside an eggshell.